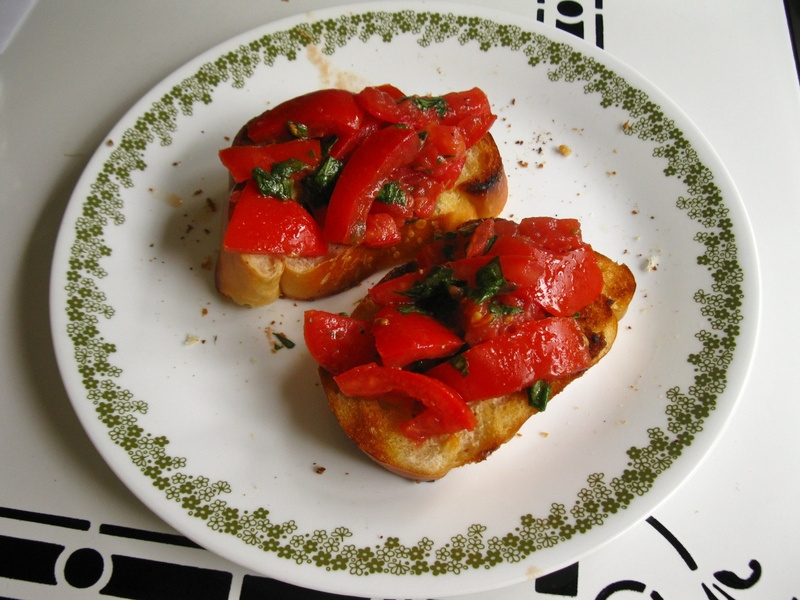 Bruschetta has been on my mind. I was recently in Costco with my mom, and as she browsed the DVDs, I looked over the cookbooks. There were at least four by the same publisher on authentic Italian cuisine. With bruschetta recipes galore. And, who could forget that scene in “Julie and Julia” where Amy Adams and Chris Messina moan over delicious, dripping handfuls of bruschetta for dinner? The first time I saw the film, I didn’t know what they were eating (peppers on top?) but I knew it looked absolutely magnificent. So, since I had just baked bread the other day, I decided to buy some tomatoes and garlic before all the rolls disappeared. 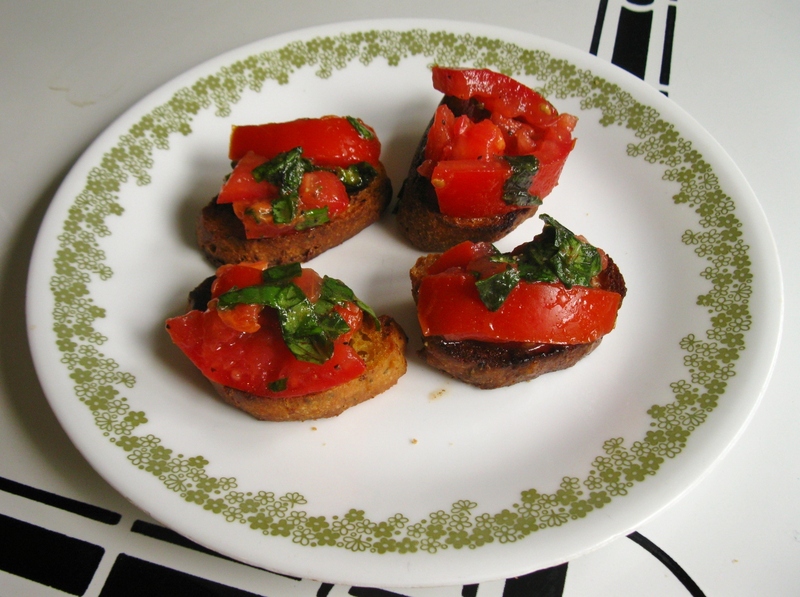 Traditional bruschetta with gluten-containing French bread - a Father's Day present. And it was so delicious. I have always been a huge fan of basil. It’s my favorite herb. And I don’t know what it is about pairing basil with ripe tomatoes, but they just bring out the best qualities in each other for the most satisfying taste. 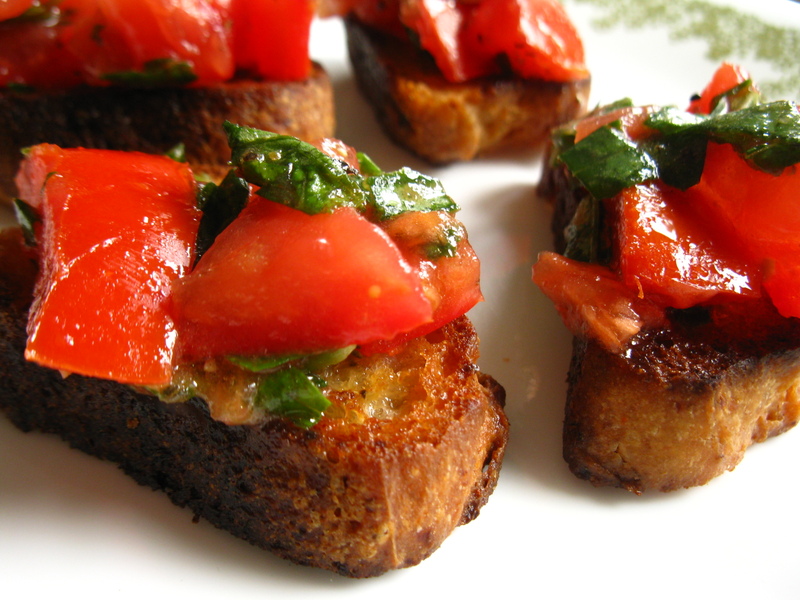 Bruschetta is super easy to make, actually. It’s so tasty it’s hard to believe. But I bet if you ordered this at an Italian restaurant (first of all, it would have to be a really nice Italian restaurant), it would be a bit pricey. And for something with such simple ingredients. I had such a good time making and eating this dish that I made some with the traditional French bread (yep, with wheat) for my dad. It was Father’s Day after all … and it was fun serving up a scrumptious plate for him. 1. In a large skillet, eat some olive oil. Then place sliced bread down to toast. When golden brown, flip over to fry other side, adding more olive oil as needed. 2. Meanwhile, seed the tomatoes. Cut off the end of each tomato where the vine grew. Then, over a small bowl, squeeze the tomato so extra juice and seeds run out. This way you keep more flesh of the tomatoes and get rid of the too-juicy parts. 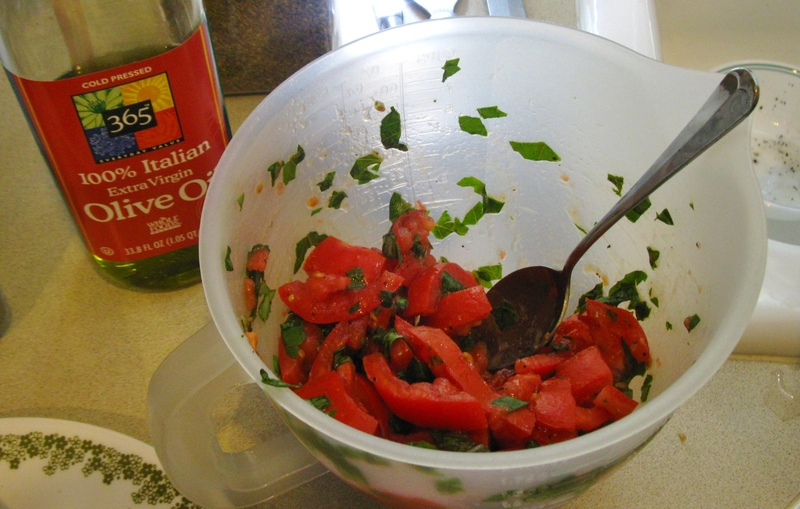 Then cut tomatoes into 1/4-inch pieces and place in a large mixing bowl. 3. Chop the basil and add to the mixing bowl. Add salt and pepper and gently toss. 4. When the bread is finished frying, remove from heat and let cool until able to handle. 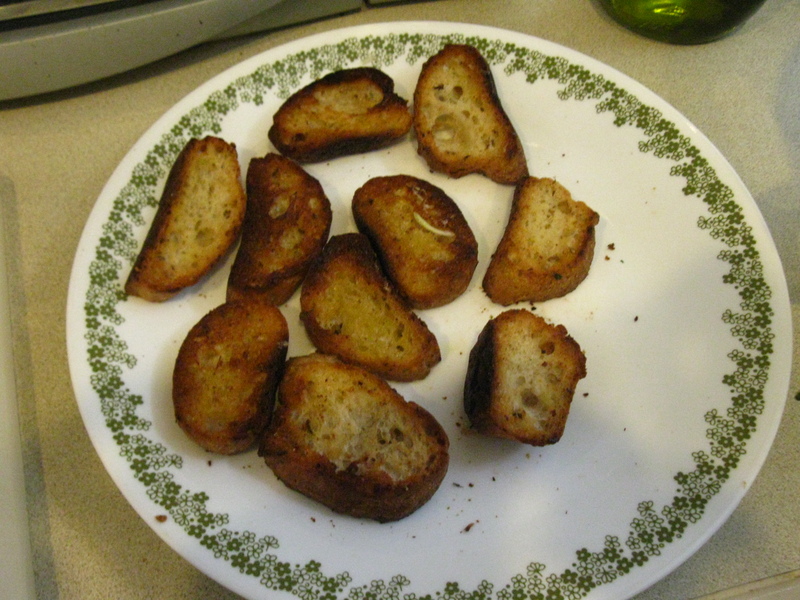 Rub each side of toast with the cut side of garlic. Discard garlic. 5. To serve, spoon 1 heaping tablespoonful of tomato mixture on a toast slice and enjoy! Became a voracious, unapologetic bookworm in 4th grade after reading the first three Harry Potter books. Have a thing for dystopias, young adult novels, classic literature and funny memoirs (re: Mindy Kaling / Tina Fey). English and journalism geek, media and pop culture critic, food writer and blogger, editor of an entertainment magazine. Hobbies include: my Netflix account, cooking, gardening, music, art and hiking. This blog is free of gluten, dairy, eggs, corn and mushrooms. It also avoids soy, sesame and nuts.